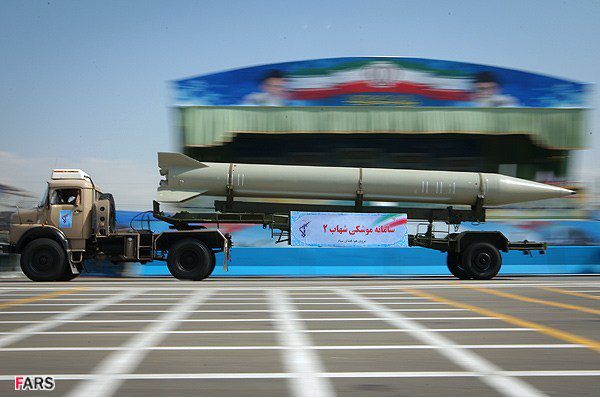 The Shahab-2 is the Iranian variant of the Russian SS-1D ‘Scud C’. It is a single-stage, liquid-propelled, short-range ballistic missile. Its maximum range is 500 km, and it carries a single warhead with the maximum payload of 770 kg. The Shahab-2 was tested in July 1998 following its introduction into service in 1997. In 2004, the missile became an active participant in all military drills and exercises. An improved variant, Qiam-1, was first tested on August 10, 2010. The Qiam-1 is very similar to the Shahab-2, but it has a triconic shaped reentry vehicle, heavier launch weight (6,155 kg), smaller payload (750 kg), longer range (800 km), and enhanced accuracy (500 m CEP).4 Iran conducted a second successful flight test on February 10, 2014, and a third on March 9, 2016 during a larger military exercise.5 According to Iranian media, Iran fired at least one Qiam-1 missile in its ballistic missile strike against ISIS targets in Syria on June 18, 2017. Missile Defense Project, "Shahab-2 (Scud-C variant)," Missile Threat, Center for Strategic and International Studies, August 9, 2016, last modified June 15, 2018, https://missilethreat.csis.org/missile/shahab-2/. Andrew Feickert, “Iran’s Ballistic Missile Capabilities,” 3, (Congressional Research Service, August 23, 2004), http://fpc.state.gov/documents/organization/39332.pdf. Nuclear Threat Initiative, “Hama Missile Base and Production Facility,” (NTI), http://www.nti.org/learn/facilities/484/. Duncan Lennox. “Shahab 2 (Qiam, SS-1D ‘Scud C’ Variant.” Jane’s Strategic Weapon Systems (Offensive Weapons). September 10, 2012. CSIS Missile Threat, “Iranian Missile Launches: 1988-Present,” August 17, 2017, https://missilethreat.csis.org/iranian-missile-launches-1988-present/.